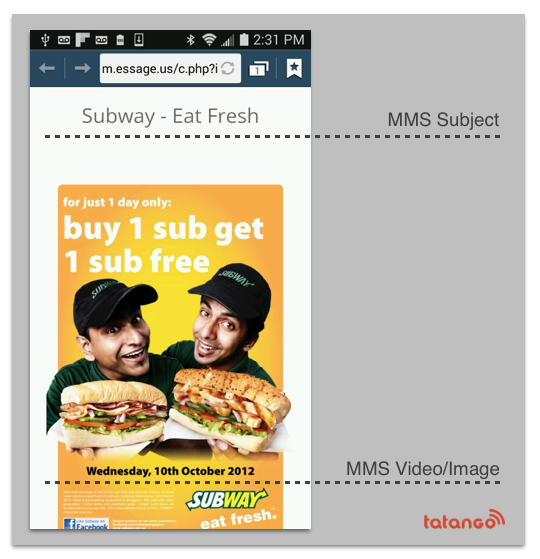 An MMS message will allow you to send both images and videos to your subscribers. Below are the specifications for uploading images and videos to a message. You're also able to include up to 500 characters of text in the message. 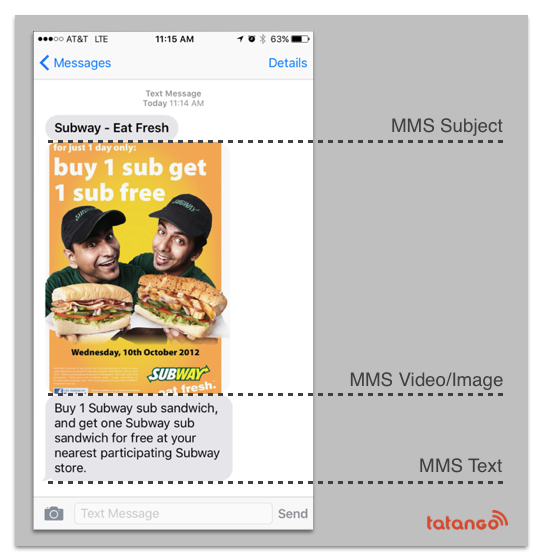 SMS Fallback Information: Some phones aren't able to receive MMS messages, so in those cases, Tatango will send an SMS message to those phones, with a link to the image or video that they can access via their phone on the mobile web. This link is auto-generated, and reduced the amount of characters for the SMS fallback message from 160 characters to 120 characters. We recommend only to use vertical (portrait) or square images as nearly all modern device screens are vertically aligned. We recommend file be in .JPG format. PNG files will be converted to JPG for maximum deliverability. No matter what size image you use, be sure to not exceed a file size of 500Kb. We recommend an image that is 640px by 1138px, or 1080px by 1920px, both have the same aspect ratio of 9:16. The images will be sized to meet the width of most screens. It's important to note that on the iPhone 5s, and iPhone 6, when a static image is opened, it's opened in preview mode. This mode includes a top and bottom navigation bar, which covers a small portion of the top and bottom of the image. When a user touches the image in preview mode, the top and bottom navigation bars are removed, allowing the user to see the full image. It's because of this that we recommend that you don't put any "content of interest" in the top 129px and the bottom 89px of the 640px by 1138px image, or in the top 218px and the bottom 150px of the 1080px by 1920px image. The Tatango platform will transcode your content to the appropriate file sizes for each carrier and device while keeping the file proportions in tact. Animated images should be in .gif format. Animated PNG is not supported. Because of file size limitations, we do not recommend the use of tall images that fit the entire screen because the image file size is usually too large. Instead we use square or tall images, which are smaller in file size, but will leave some empty space above and below the image on the mobile phone when opened in preview mode. The smaller image dimensions still fill the messaging bubble in conversation mode. For animated GIFs, we recommend either 480x720(tall), 480x640(tall), 640x640(square) 480x480(square) sizes depending on the amount of animation. The most important part is to keep the animated image under 600Kb. If you exceed 600Kb, you will be significantly decreasing the amount of mobile phones that will be able to display the animated image properly. When creating the animated image, you do not want the animation too quick or video-ish, because the more layers that are including in the image, the larger the file size will be. We recommend creating your animated image with frame speed no faster than one every half second. Animated images should have no transparency. Transparency does not work in some devices MMS players and the transparent layer will appear black. When transcoding an animated gif we do not change the number of frames, frame speed or cut the image. We will reduce the dimensions of the animated gif by 25% and 50%. We will also apply compression to the animated gif. The results of our compression will vary based on the number of colors and compression you have already applied to your source animated gif. Always test your animated gif before sending it to your list. Max video size is 20MB, and Tatango will use it's transcoding engine to reduce the file size down to be accepted by wireless carriers. For videos, the max video duration is 25 seconds. The longer the video, the lower the quality potentially since we have to apply more compression. The more movement in the video will lower the quality since it requires higher bitrate and thus higher file size in less time. 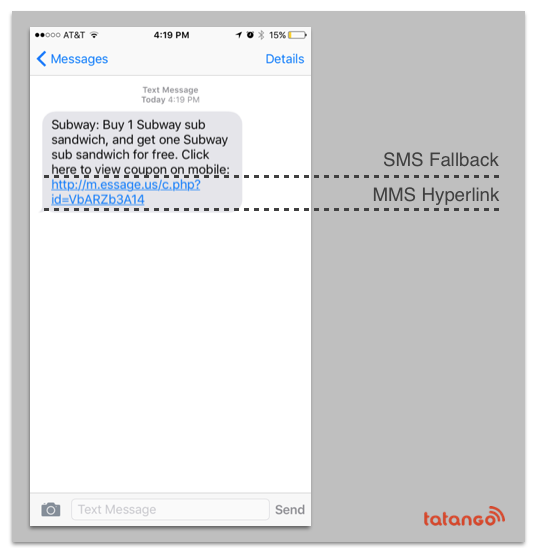 If you exceed the file size or time limitations above, we may be forced to send your fallback SMS message, with a link to the video, which can be watched on a subscriber's mobile browser. Always test your video before sending it to your list. For landscape videos we recommend (16:9) 1280w x 720h and for vertical videos we recommend (16:9) 640w x 1138h.